Gold news update: Gold prices today (Wednesday) edged higher, pulling up from an 11-week low. On Tuesday, spot gold dropped 1.7% – the biggest one-day drop since mid-July. The yellow metal was last quoted up 0.3% this morning to $1,269.26 an ounce. December gold was up $2.70 (0.21%) to 1,267.70 an ounce on the Comex. Two-and-a-half-month gold price lows were caused by a stronger U.S. dollar, bullish stock markets, and slumping physical demand in Asia. Gold dropped 2.7% in July. It broke through the $1,300-an-ounce threshold on Aug. 6 but fell back under on Aug. 15 to finish out the month with only a slight gain. The one major force that's prevented gold prices from dipping even lower has been the rampant geopolitical tensions between Russia and Ukraine, Gaza and Israel, and the incursion of the Islamic State in Iraq and Syria (ISIS) into Iraq. 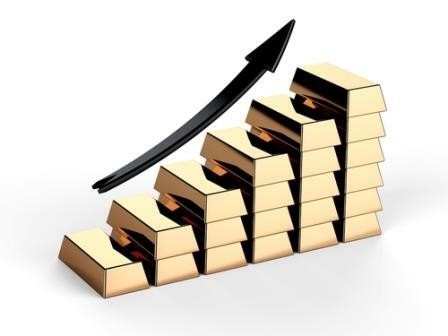 Gold – a safe-haven investment – tends to see gains when fear rises. "Given there was little physical demand and shrinking investor consumption in August, geopolitical headlines were supportive with little other reason to keep bullion underpinned and maintain that 1,275/80 support last month," VTB Capital analyst Andrey Kryuchenkov said to Reuters. "The market is bearish and we shall see a lot of technical selling now that we have closed below $1,275." Geopolitical conflicts are exactly why gold prices eased off Thursday's sharp fall. Reports from Ukraine of a ceasefire between separatists, Russians, and Ukrainian soldiers hit headlines this morning. "Mutual understanding was achieved concerning the steps which will enable the establishment of peace," the Ukrainian presidential press office said. Shortly after, the Kremlin released a contradictory statement that denied any truce. The confusion sparked buying in the safe-haven metal. U.S. President Barack Obama in the meantime sent an additional 350 troops to defend the U.S. embassy in Baghdad, following reports that ISIS militants beheaded a second American journalist in the region.